So the opening of the Middle Eastern-inspired Kismet in East Hollywood seems like, well, kismet. Renowned dude chefs Jon Shook and Vinny Dotolo (Animal, Jon & Vinny’s) are partners, but this restaurant feels unapologetically female. (I’m going to employ a few controversial stereotypes now—bear with me.) It’s pretty, for one, in that fresh-faced, Neutrogena-girl way, with white walls and blond wood and impossibly waifish glassware. Coffee comes in a dainty carafe with a daintier anise shortbread cookie. The menu features all sorts of noncommittal feminine terminology, like “Salad-y,” which denotes the shareable vegetable-based dishes that would elsewhere be called meze: marinated feta with squash; hunks of Persian cucumber with citrus, rosewater labneh, and za’atar. The “Turkish-ish Breakfast” is a spread of cold morning fare with a sesame-scattered wedge of Bub and Grandma’s barbari bread. At first everything may seem so airy and effortless that you worry it all might float away like somebody in a whipped-yogurt commercial. But then a sturdy bowl of freekeh porridge (they call it “polenta”) arrives with morsels of braised lamb and a sparkly green chile relish. Across the room you spy a platter of rabbit with triangles of griddled “flaky bread” for swiping through a stew of spiced chickpeas. Not everything on the menu is sprinkled with pixie dust, however. 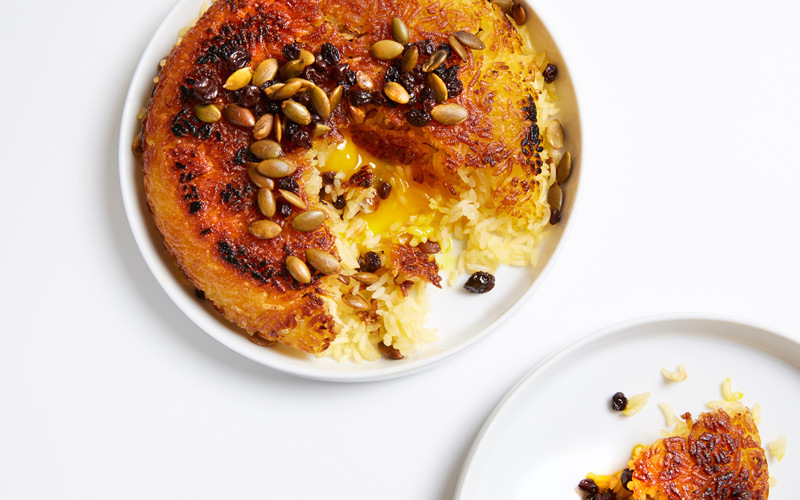 There’s a dome of crispy rice studded with currants and egg yolk that is tasty if eyebrow raising at $14, and I miss some of the deeper flavors that one finds in other parts of the eastern Mediterranean. But this food, which is rooted in the milder Israeli palette, is also exactly what L.A. calls for—and exactly what I want to be eating all day long.